Last December I went into a long spiel about how I worship at the altar of carrera marble. I was desperate for my mom to include a marble washstand in her new home, and after much debate - But Alaina, where will we store the extra toilet paper rolls? - I won! So happy to show off the transformation from 1980s wallpaper and built-in cabinets to what this lovely little space is now. And I'm pleased to say the extra toilet paper and hand towels have a lovely home, nestled beneath the washstand in a wire basket. 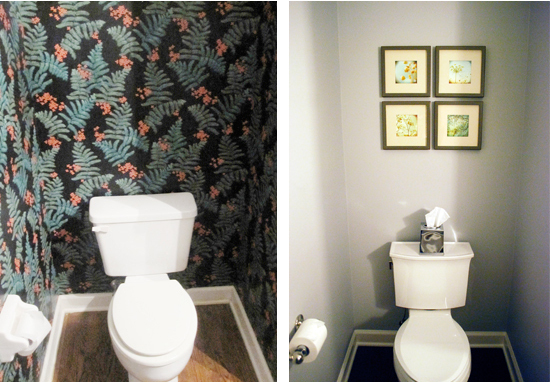 To view the before and afters of my mom's living and dining room, click here. *I realize the lighting is off in all the photos, but the walls are in fact grey. Who's not surprised? Looks so pretty! I hope she loves it. I kinda liked that wallpaper in the before but the space definitely needed updating. 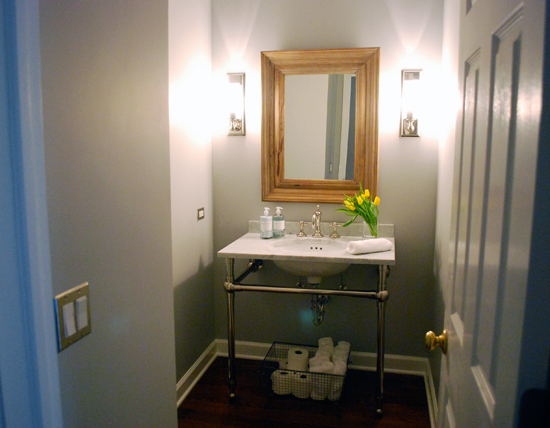 The vanity is gorgeous! I love this bathroom. 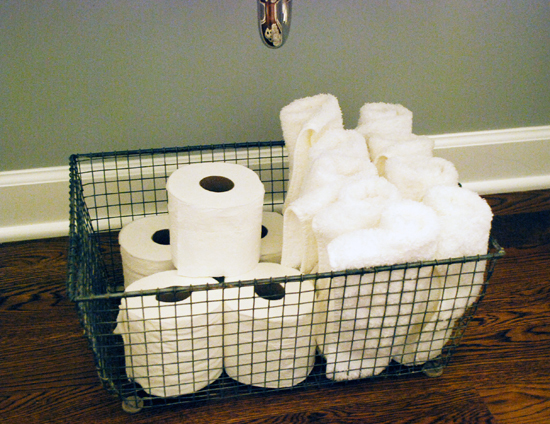 Everything about it is so soothing right down to the wire basket that holds the toilet paper. This is beautiful! I love the wire baskets! This is an insane transformation! I love it! And I'm such a fan of tp in baskets. Is that odd? Beautiful! 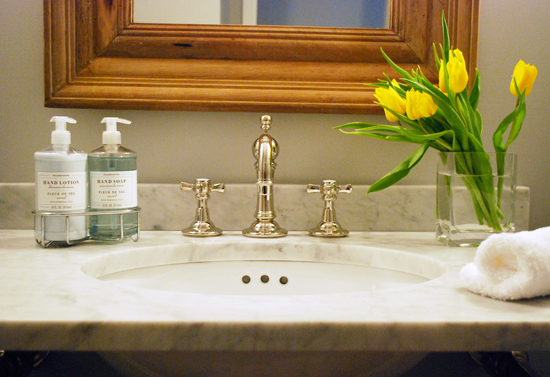 My husband and I are currently having the "vanity vs. pedestal sink" debate, but perhaps this style is a good compromise...I love it! Love the wood floor too. I cannot believe this before and after! Wow, so beautiful! I love that is so simple and sophisticated at the same time. And SHEESH what a transformation! So gorgeous! Classic and lovely. Your momma is so lucky! I imagine she's now fully on board with the toilet paper storage, right? Gorgeous! 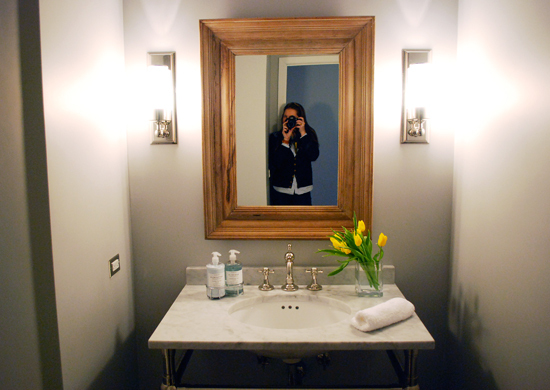 I'm a big fan of Carrara marble, too. Looks great, love the sink, the lighting, all of it. Gorgeous! I know I've said this before, but your designs are always my favorite posts! Love the way the bathroom looks! That looks great! 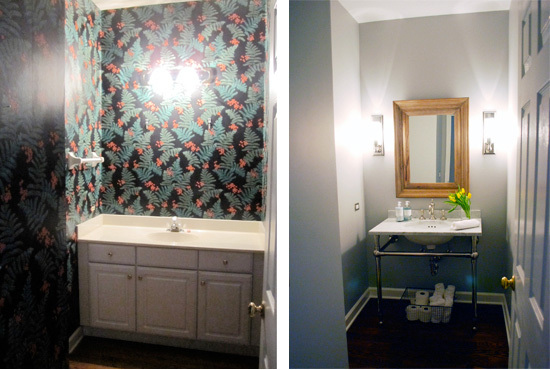 You both won -- you were right and now she gets an amazing bathroom. Nice work! Great work! Looks really pretty! The vanity is gorgeous. Great job! Hooooooooly moly what a difference!! Wonderful work :) Just fab. From dark, cramped and dated to light and elegant - with a very French accent. A lovely makeover! Congratulations.